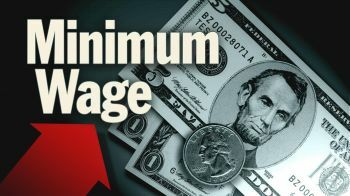 CHARLOTTE AMALIE, St Thomas, USVI- The US Virgin Islands (USVI) minimum wage is set to see its final phased increase to $10.50 per hour as part of a bill ratified by the 32nd Legislature and signed into law by Governor Kenneth E. Mapp. The three-step increase, which saw the hourly wages of US Virgin Islands employees going from $7.25 to $8.35 in 2016, then from $8.35 to $ 9.50 on June 1, 2017, will increase to $10.50 on June 1 of this year. According to Government House, during a recent cabinet meeting on St Croix, Governor Mapp instructed commissioners to raise the salaries of government workers in compliance with the minimum wage increase set for next month. According to the Fair Labour Standards Act, state governments have the right to set a higher minimum wage than the current federal minimum wage rate. Roughly 29 states, including California, Florida, New York and New Jersey have enacted legislation increasing their state’s minimum wage. Studies have shown that increasing the minimum wage does not have a negative effect on small business, as some have claimed, and in fact contributes to an increase in the overall health of local economies. Federal minimum wages have not been increased since 2010, however the cost of living has seen a sharp uptick throughout the country, particularly here in the Virgin Islands where the cost of electricity alone has risen by 11 percent between the years of 2010 through 2015. “Adjusting the minimum wage to take into account the increases in the cost of living, especially around such basic necessities as food, rent, and clothing, will go a long way to eliminating the “working poor” in our community and improving the overall quality of life for all of our residents,” said Mr Mapp after approving the measure. “While this step is not the answer to all of our economic development and opportunity needs, it is a significant step in the right direction,” he added. Take note about what? An increase to $10.50 for the BVI? That will be suicidal as this rate would not be sustainable even before the storms. BVI population of $30K with approximate total workforce of 19K before the storms and minimum wage of $6.00 according to Statistics Office. Remember , the rate must be based on what the economy can take and not about a wage that can pay all of the bills of the minimum wage worker. Many of you need a basic course in how the economy works. The robustness of an economy s based on the availability of goods and services to sell, the price at which buyer is willing to buy, and the quantity of sellers and buyers are available. All of these 3 factors must exist for a robust economy to work ! !This is ECONOMICS 101 ! ! ! ! You must be one of the business owners that is a direct descendent of slave traders or a colonial master to make that comment. Why does internet service for e.g. cost so much and for the slow speeds we get? Blame can be laid squarely at the feet of successive governments for not enacting legislation to benefit the working class. BVI is in the train heading towards a clas war. Many economic studies have shown that increase in min. wages (structures) actually have a positive effect on he eoonomy. Where is rent control? What is the CPI and RPI for the BVi for say the last 5 years? Happy workers make a happy business that thrives even in the face of stiff competition! Soooo Bvi Goverment!!! What ya’ll really doing!!! We need reach there as well. Can’t even say who is next because we are in decline as we speak. NDP has really done us dirty. Nada, Zipped. They have not lived up to any of their campaign promises. The sitting gov’t can save what will be left of our financial services before the migration starts, that’s the most we can hope-for right-now from a failed bunch. do you need some help packing? Is the cost of living higher in the USVI than in the VI? What is obvious is that the cost of living in the VI is skyrocketing and exponentially rising yet the minimum wage is $6 per hour. At this rate, a VI worker grosses $960.00 per month while the USVI worker earns $1680.00, $720.00 or 75% higher. Each low or non-skilled VI worker should earn a living wage; a gross monthly wage of $960.00 is definitely not a living wage. Hopefully, VI employers have more compassion for their workers and families, paying them much more than the minimum wage. Moreover, theorectically, the minimum wage is a supply(workers) and demand (employers) issue, ie, more is demanded at a lower rate and less at a higher rate. Generally, there is a large supply of low skilled labour so a high minimum wage can lead to fewer people being employed, resulting in a potential rise in unemployment among the low skilled and hurting the people it (minimum wage) was intended to help. However, on the other side of the coin, in practice, low skilled workers spend a higher perecentage of their wages on food, shelter, clothing, entertainment........etc than other others, boosting the economy. Putting more money in the pockets of low skilled workers, ie, tax cut, boosts the economy. They earn less but has a propensity to spend a higher a percentage of their wages. As the saying goes, if you want to boost the economy put money in the pockets of those at lower rung go the economic ladder. That said, while $10.50/hour is quite a lot more than $ 6/hours, keep in mind that USVI payroll taxes are higher than the BVIs, so the net gain is not as high as it appears at first blush. And, $10.50/hour is no living wage in the USVIs. Mapp needs to be relected and folks are so vunerable at this moment .Election is around the corner and sooner rather than later people gonna cry out for more watch and see as it gonna be taxes and more taxes. All you know that is part of government strategy a raise then they take it back in taxes. Come and see oh. I think prices for almost everything are higher in the BVI, than the USVI. Minimum wage is slavery pay in the BVI. And Social Security payments to those who paid into the scheme for umpteen years is SHAMEFUL. No one can live on Social Security monthly checks. So if you are paying in to the Social Security Scheme don't expect to collect enough to live miserly. But, wait, your leaders are busy protecting dirty money people names! Go figure? No wonder they don't have time to think about/help get increases for SOCIAL SECURITY RECIPIENTS or minimum wage earners. Time to wake up and speak up, in the BVI.